Digital evidence collector eviFile and cloud-based Building Information Modelling collaborator 3D Repo hope to encourage more use of BIM in construction through a strategic partnership to combine both tools. The partnership will see 3D Repo offer revision control, issues management and BIM data analysis services to clients. eviFile will contribute its expertise in project management, inspection test plan completion and data relay back into the model in real-time on site. While this collaboration is still in the early days, the organisations confirmed they have been commissioned to work together on a major UK groundworks project. 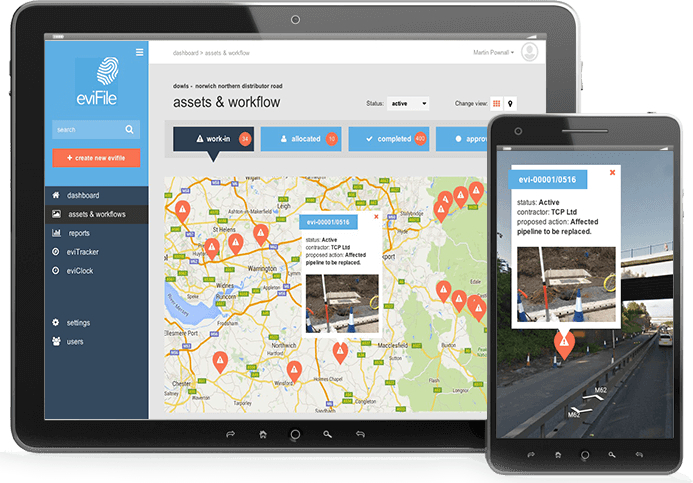 Headquartered in Leeds, eviFile has developed a smartphone and tablet app that allows field operatives to use their device’s camera and GPS to record the work they’re undertaking. The software captures information about time, date, geographical location, user and device orientation. Commenting on the partnership, eviFile managing director, Luke Allen, said: “This is an industry-leading partnership which has huge potential for construction projects. eviFile stands apart in the sector for powerful and secure digital evidence collection which protects brands and avoids disputes. “Combining this with 3D Repo’s modelling capabilities creates a compelling offer for construction companies, who can now track issues in the build stage within their modelling. eviFile is used by Network Rail, Balfour Beatty and John F Hunt among others. London-based 3D Repo has created a collaborative BIM platform powered by the cloud that allows users to securely log in from any web browser. The software is aimed at helping construction clients and contractors realise significant efficiency savings, replacing traditional systems with poor interoperability and large data sets. 3D Repo founder and CEO, Jozef Dobos, said: “Linking these two systems means we can provide clients with richer data and a single source of information on their project. 3D Repo works with Arup, Atkins and Canary Wharf Contractors.